And the Chinese researchers say the approach could pave the way for a "new era" in medicine. They were genetically engineered to manufacture drugs that control blood sugar levels such as insulin - but only in response to light. Then comes the tech - a set of wirelessly powered LEDs and a smartphone app to control them. The team said the findings "could pave the way for a new era of personalised, digitalised and globalised precision medicine". Prof Mark Gomelsky, a molecular biologist from the University of Wyoming, said the study was an "exciting accomplishment". He added: "How soon should we expect to see people on the street wearing fashionable LED wristbands that irradiate implanted cells engineered to produce genetically encoded drugs under the control of a smartphone? 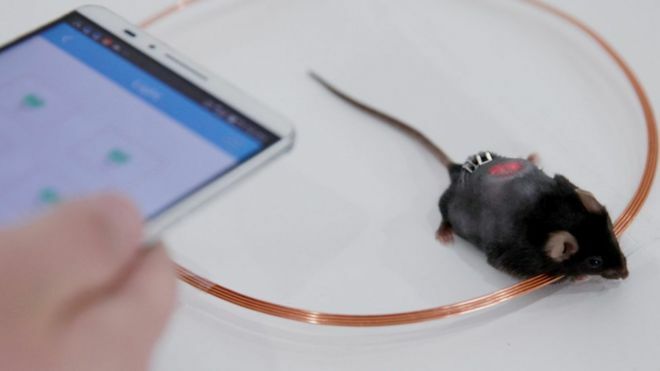 Scientists have used a smartphone to control the activity of the living cells inside an animal, BBC reports.